We were created to be set apart for Him. Do you long for something more than the shallow, self-focused, pleasure-seeking femininity so prevalent today? Do you want a focus beyond chasing male approval and pop-culture appeal? Do you need a fresh vision of God’s amazing purpose for your life as a young woman? Are you ready to become one of the few in this generation who will make an eternal impact upon this world? Discover Set-Apart Femininity. 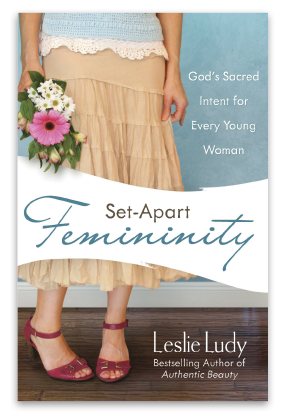 In this powerful, candid, and conversational book you will gain a compelling vision for femininity that can forever alter your existence and take you far beyond the unfulfilling trends of modern culture. This book is not the same old mediocre message you’ve always heard. It’s a radical call to a counter-culture lifestyle in which every aspect of your femininity—from the way you relate with guys to the focus and direction of your life—is shaped by an intimate relationship with the King of kings. It’s the kind of heroic femininity that the world-changing women of history understood. And it’s well within your grasp, no matter where you’ve been. Get ready to experience the lost art of set apart femininity—and find what you’ve been searching for. Great for teens, college-aged women, and singles.